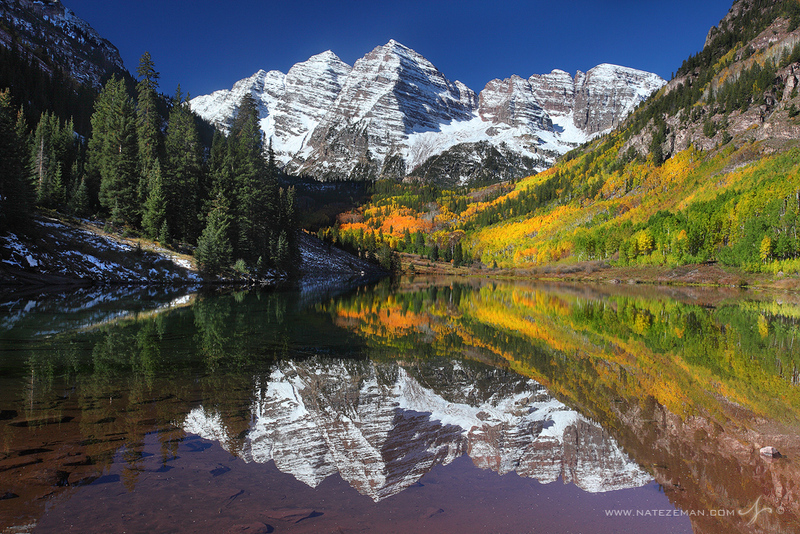 There isn't much to say about the Maroon Bells that can't be summed up in a photograph. It's simply one of the best mountain views there is. When you factor in the Bell's easy accessibilty it's not hard to see why this is one of the most photographed locations in North America. Photographers travel from all over the world to capture this stunning landscape. I'm lucky to live in Colorado, and have spent many sunrises behind my tripod at the shore of Maroon Lake. It's impossible to take a bad picture here, but surprisingly difficult to get all the elements to come together for the image you really want. On this late September morning, a fresh dusting of snow capped the high mountain peaks. The changing leaves of the aspens were as brilliant as I have ever seen them here. The winds cooperated and the mirror like waters of Maroon Lake reflected the landscape perfectly. Every time I shoot here I come away with something completely different. I can't imagine I'll ever grow tired of shooting this location.